While Americans obsess over alleged "Russian hacking," Noam Chomsky questions why political influence from Israel is being ignored. 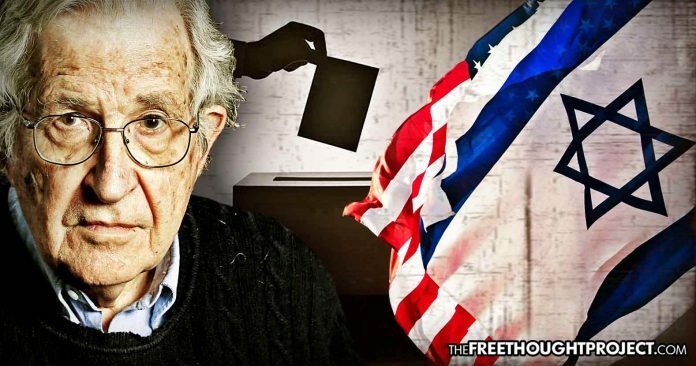 World-renowned author and lecturer Noam Chomsky pointed out in a recent interview that Israel has actually had far more influence in the United States political system than Russia ever has, in the wake of mass media hysteria about alleged “collusion” in the 2016 election. That’s only one part of it. Lobbyists practically write legislation in congressional offices. In massive ways, the concentrated private capital, corporate russector, super wealth, intervene in our elections, massively, overwhelmingly, to the extent that the most elementary principles of democracy are undermined. Now, of course, all that is technically legal, but that tells you something about the way the society functions. So, if you’re concerned with our elections and how they operate and how they relate to what would happen in a democratic society, taking a look at Russian hacking is absolutely the wrong place to look. Well, you see occasionally some attention to these matters in the media, but very minor as compared with the extremely marginal question of Russian hacking. Chomsky is one of the few intellectuals in the public eye who can get away with being so critical of Israel, because he has Jewish heritage, despite being non-religious. It is common for anyone critical of Israel’s policies to be labeled as an anti-semitic. Pink Floyd frontman Roger Waters, another outspoken critic of Israel, said in a 2016 interview that anyone who speaks out about the apartheid state is labeled as anti-semitic. Last month, The Free Thought Project reported that South Carolina passed a law to legally define criticism of Israel as “anti-Semitism,” showing a concerted effort to stifle criticism of a government that is indiscriminately killing innocent people, and keeping an entire population in poverty and constant terror. Governments are not alone in this suppression of information either, tech corporations that now control the media narrative are also taking efforts to prevent people from seeing the true face of the Israeli military. YouTube has been engaging in censorship of Israeli war crimes, as journalist Abby Martin called attention to earlier this year when a video that she made about the violence in Isreal was flagged as “hate speech” and blocked by YouTube in 28 countries. Despite the best efforts of the Israeli government and their NATO allies, the world is beginning to wake up to the struggle of the Palestinian people. Even the United Nations is taking a new interest in the situation, with the recent announcement of a war crimes investigation of the Israeli government’s actions.